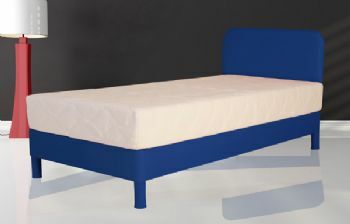 Our unique children divan beds have been relaunched with updated styling and colours. The Jazz divan beds are made especially for children with a low centre of gravity and a choice of 11 different and vibrant colours from orange to black. The base comes complete with sturdy legs which match the colour of the base. Each of these 11 colours is made from 100% polyester which is not only tough but water resistant too! These are gorgeous divan beds which kids will truly love. Headboard is made from a thick 100% polyester material giving you a strong and durable product that will withstand the daily activities. While being sturdy and strong you still end up with a beautifully finished and hand made product. This base is backed with a durable and strong wood. This provides a bed that allows you to rest on without feeling flimsy. This mattress is especially created for kids keeping their comfort in mind using 5cm layer of high density visco-elastic polymer gel and a total thickness of 15cm. Originally designed for NASA missions, it is soft and pliable following the outline of your body perfectly. The traditional coil spring system is used to give additional comfort. This Mattress is made from unique upper layer of high density visco-elastic polymer gel. Originally designed for NASA missions, it is soft and pliable following the outline of your body perfectly. This memory foam mattress provides the best possible support to your body spine allowing your body to immediately find the best possible sleeping position. 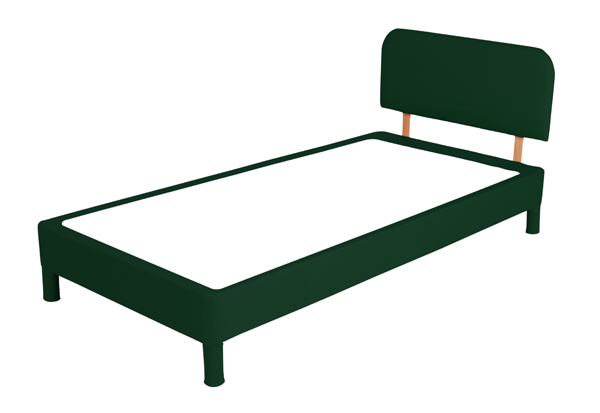 This mattress is constructed of approximately 14cm of reflex foam with a layer of approximately 1cm memory foam. This mattress has a total thickness of total of approximately 15cm thickness. The Comfy mattress is especially created for kids keeping their comfort in mind and has a novelty design. This mattress is constructed by using coil springs and boundary of reflex foam to reduce the chance of rolling off the bed. This mattress has a total of 15cm thickness and is available in fun stick figure with red heart (Moo Moo) or blue car (Choo Choo) design. The Reflex mattress provides firm orthopaedic support helping to maintain the correct alignment of the spine and neck for a healthier and comfortable night sleep. Unlike the comfy mattress, the reflex mattress has no springs. This mattress has a total of 15cm thickness and is available in fun stick figure with red heart (Moo Moo) or blue car (Choo Choo) design. This memory foam Mattress is made from unique upper layer of high density visco-elastic polymer gel. Originally designed for NASA missions, it is soft and pliable following the outline of your body perfectly which includes a fun design cover. This memory foam mattress provides the best possible support to your body spine allowing your body to immediately find the best possible sleeping position. This mattress is constructed of approximately 14cm of reflex foam with a layer of approximately 1cm memory foam. This mattress has a total thickness of total of approximately 15cm thickness. The memory foam mattress is available in fun stick figure with red heart (Moo Moo) or blue car (Choo Choo) design.